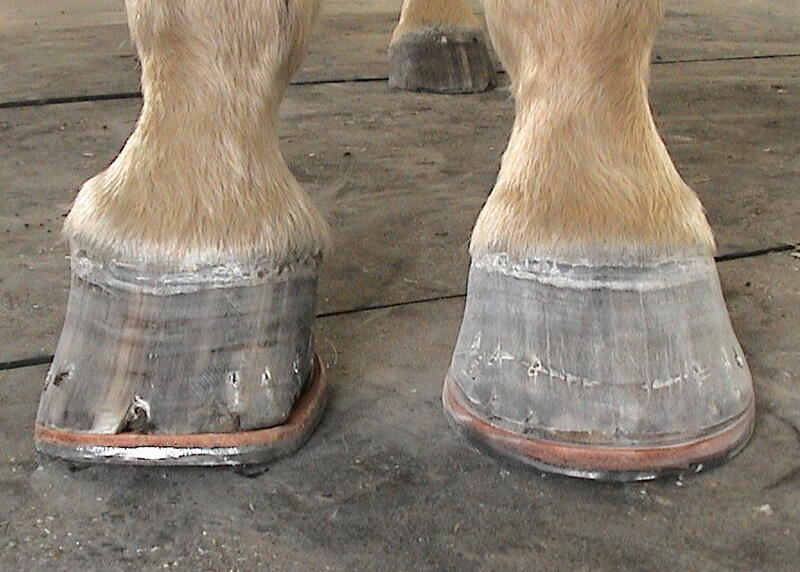 When asked to work on a horse with a club foot, take extra time to evaluate the whole horse. Look at the horse from all angles. Watch the horse as it takes a couple of steps; this can help you see where the foot cannot take stress. A horse will protect himself just as you do when hurting. 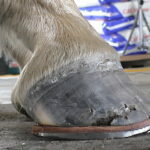 Learning this and understanding the lame horse is mandatory for a farrier to have a successful, positive shoeing experience. Doing anything less is simply application, not correction. help determine the end result. This particular horse, a six year old gelding, has what I feel is a grade three club foot (on a 1-5 scale). with this horse since it was a foal. 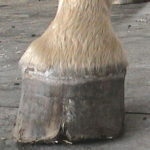 This horse found it difficult to stand square or under himself before shoeing. 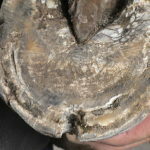 In photo 1 you can see the dish in the hoof wall is at or just below the coronary, a grade 3, whereas a dish at or just above the end of the toe would likely be considered grade 1 or 2. 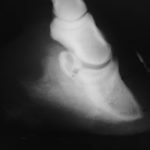 This club foot, as seen in photo 2, has very straight medial and lateral walls, versus only medial or lateral. 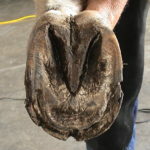 Look closely at photo 3 and you can see hoof growth at the heel is approximately twice as much as the toe growth. There is separation of the wall from widest area medial to widest area lateral shown in photo 4. The bars are starting to close in or point towards the frog as you can see in photo 5. If the end of the bars are not opened as I did on the right (I simply use a rasp and knife) they will start to pinch and narrow the frog. 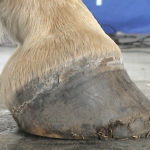 There are several other factors that contribute to this horse’s lameness. Look at photos 6 and 7. Notice the pronounced side bone. 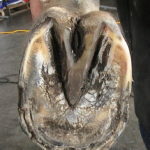 Photo 8 shows a prolapsed sole that is painful, making it impossible to have a normal stride. Also notice the degenerative sole growth just in front of the frog. This is from osteomyelitis or infectious bone. 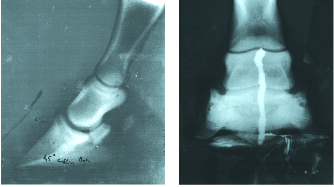 Photo 9 is the lateral x-ray showing the remodeled bone and poor quality of the bone. 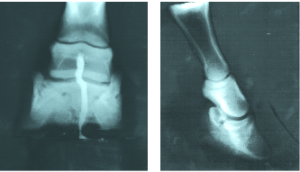 The toe crack in photo 10 has also been the site of drainage from abscesses due to micro fractures from the distal end of the coffin bone. With all this in mind I decided to modify a shoe to do several things. 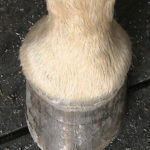 Rocker the shoe both toe and heel to allow for ease of break over and landing, add a leather rim pad to raise the prolapsed and painful sole off the ground and fit the shoe more medial to center the frog while putting the hoof support closer to the center of the leg (photos 11 and 12). Before applying this shoe it was almost impossible to pick up the left front. After application of the modified shoe to the right I was then able to shoe the left. I also applied a thicker rim pad to the left front to raise that side allowing the right foot and leg to be more square and weight bearing. You can see in photo 13 that the left front is much wider than the right, a result of bearing more than its share of weight over the years. 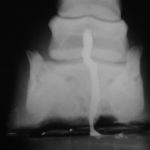 Our thanks to Dr. Bruce Lyle for providing radiographs on this horse and to the owners – Chad & Cathy Pippen for allowing us to work on their horse in a recent clinic. All reside in Aubrey, Texas. 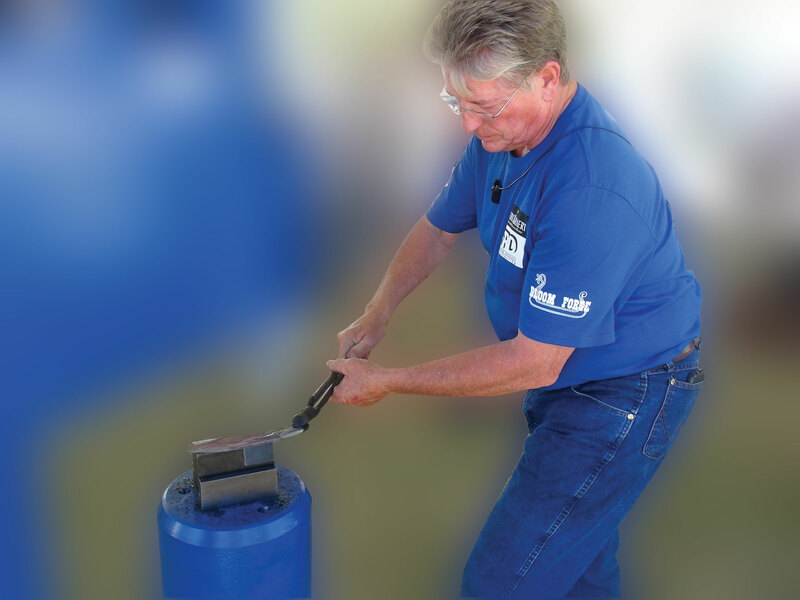 This article is from The Natural Angle Volume 8, Issue 3 – written by Dave Farley, CF APF. 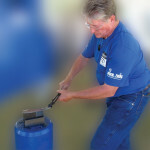 For more Natural Angle articles and tips, click here.